Seriously, I had to look this up four times to make sure I was getting this right. 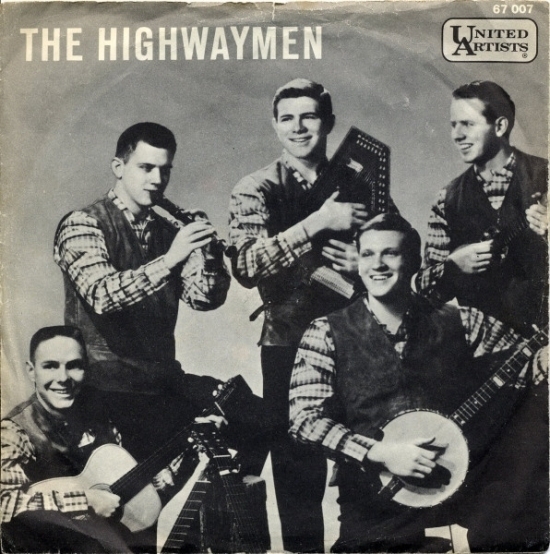 First off, the Highwaymen, or at least the version I remember was the country supergroup of Johnny Cash, Willie Nelson, Waylon Jennings and Kris Kristofferson, and since all of them were young adults in 1961, this seemed possible with the exception of one fact: They put out their first album in 1985. Second, the chart topper in question is a song that most remember as a camp song, at least that’s how I remember it, and certainly not as a mainstream pop hit from the early 1960’s. It looks like both are true. When the Kingston Trio broke through and put folk music on the map in terms of commercial viability, the door burst wide open for groups like the Highwaymen, who much like the Kingston Trio were more about entertaining people with their harmonies than about changing the world with their lyrics, and the foursome who met at Wesleyan University were at the right place at the right time and much to my historical surprise, picked the right song. “Michael (Row the Boat Ashore)” originated as an African American spiritual song from Civil War times and like so many song with an oral tradition such as this, there have been variations on the lyrics, but the crux of it being a song of faith never wavered. Like so many genres of music, folk music was splintering and there were the friendly folksters like the Kingston Trio and the Highwaymen and then there was Bob Dylan, and his crew who sang about change, but in’61 a religious hymn in what was still predominantly a God fearing country could go number one on the pop chart, a feat that Bob Dylan never accomplished. While you can’t feel bad about the career that Dylan had, it is possible to feel a little sorry for the Highwaymen, whose biggest hit is barely attributed to them anymore. Pete Seeger, who recorded it in 1954, is remembered for it more, and in some circles, so is Harry Belafonte who took a crack at it in 1962. The Highwaymen would have a few more hits, but are representative of an era of folk music that is not celebrated, and trashed often by folk music enthusiasts. The group, which amicably disbanded in 1964, would actually sue the country supergroup over copyright infringement. A result of the settlement was that the original Highwaymen, would open up for Cash, Nelson, Jennings and Kristofferson, but while they gave them a payday, the court of popular opinion had decided who the real “Highwaymen” were. Perhaps a final insult is on the excellent website (at least at the time of this writing anyway), Allmusic.com in their profile of the Highwaymen, an album cover featuring the supergroup is shown instead. Maybe they should have called themselves the Wesleyan Four instead? Other Notable Songs that charted but did not go to number one in this time period: September 4, 1961 – September 17, 1961. 9/4/61: I Fall to Pieces by Patsy Cline went to #12 hot the top in the Country and Western chart and was #6 on the Adult Contemporary Chart. Is “Folkster” a word? Let’s just say that it is. Come to think of it, I don’t remember any of my camp counselors saying “here is a little number from the Highwaymen from 1961” when they would lead us in that song. Oh, by the way…I hated camp!